I was barely three years old when I was first introduced to the game of hockey. This occurred entirely by accident. Being the independent mini human that I was at the time, I decided to take the remote that sitting on the couch and change the channel to find something else more amusing to watch. I was still new to what numbers where but I knew how the arrow buttons worked so I started pushing the buttons until I found something that peaked my interest. As fate would have it, the old television got "stuck" on a channel while trying to keep up with the button pushing. The channel it was stuck on happened to be a local sports channel which was broadcasting that days game. Due to the channel being stuck where it was, I remember just watching; partly out of boredom and partly out of innocent childhood intrigue. What were these "big boys" doing? They dress funny, why do they dress funny? Are they floating on air, is that how they move so fast? The little, black dot goes in the sideways basket and it's a good thing, right? There were so many questions going on in my little mind about this new discovery. Then, I saw him. He was a different "big boy." His hair stuck out from the"hat" he was wearing and he had a smile bigger than oceans. He "floated on the air" better than anyone (I had not yet discovered who Mario Lemieux was just yet). "Fancy hair" was fun to watch. He points to his head when he does good things (referring to his signature salute celebration when he scored). What did the grandpa (aka the older-aged reporter) call him....Yaj-grrrr? Yay-gor? After hearing it about a half dozen times, I knew what the "grandpa" was saying. The television finally caught up with itself and the channels began to change again. This brought on a wail of horror and streams of tears which caused my father to run into the room thinking I was in some kind of peril. After asking what happened, I pointed to the screen and said, "put it back!". My father, looking confused, asked what I wanted back. I remember the sheer look of disbelief that came upon him as I said these two words: "Jagr. Hockey". The remainder of the evening was spent sitting on the couch with my father and squealing with glee every time Jaromir Jagr took the ice. From then on, I was a hockey and, more specifically, a Pittsburgh Penguin and Jagr fan forever. I remember a year later being allowed to stay up to watch the Stanley Cup Finals and cheering loudly enough to wake my baby brother when the Penguins won in 1991. I remember my father explains what hockey was little by little so I could better understand it. I remember wearing a Jagr shirt to school and talking about it with the gym teacher. I remember the agony I felt when I learned what "traded" meant and that "Mr. 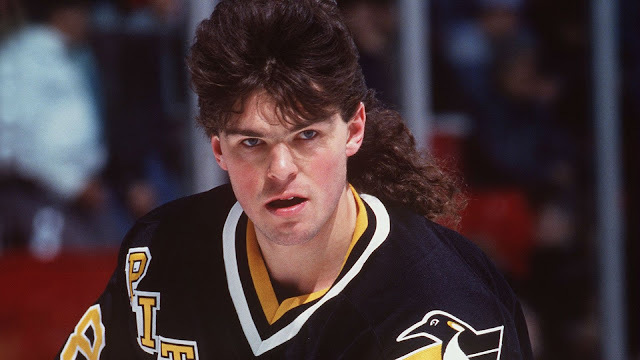 Fancy Hair" would no longer be a Pittsburgh Penguin. Still, though he made his way around the NHL for the next decade and a half, I remained a Jagr fan even if he didn't wear the team colors anymore (yes, even when he was playing for the Capitals. Hate the sin, love the sinner as they say). Some 25+ years later, the luck of the Irish smiled upon me. On March 17 2017, St. Patrick's Day, I was offered the opportunity to meet my hockey hero in the flesh. I do not "fan girl" for just anyone, but when I got that email, I fan girl'ed hard. The next day, along with a hoard of other fans, I stood in line at an autograph signing held by Total Sports Enterprises in Robinson Mall. When Jagr arrived, I was in awe of him. Being in the presence of a living legend, my childhood sports icon, was almost overwhelming. 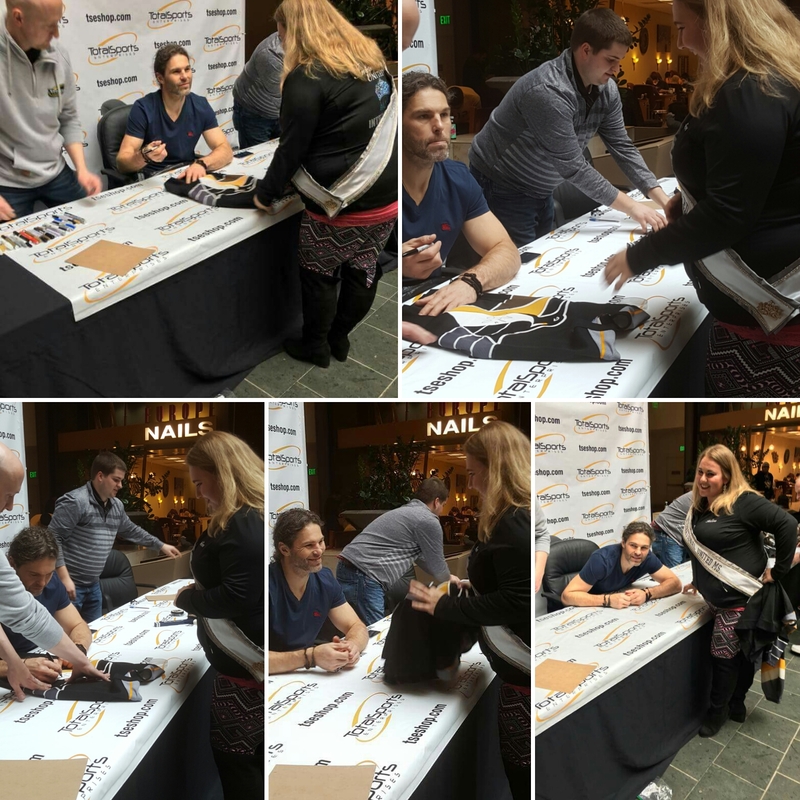 When my turn to greet Jagr arrived, I did my best to make the most of it. We exchanged pleasantries. He signed my jersey, shook my hand, and we chatted for a few minutes about the pageant sash I was wearing and what it meant. He congratulated me with that million watt smile (while inside I swooned like a 12 year old would while meeting Justin Beiber), and after a picture or two, I thanked him and made my leave so someone else could experience the magic. The autographed jersey and printed out photo's of the event will hang on the wall with glory and honor as a reminder of this amazing day. Jagr will always have a special place in my hockey heart as he will with many Penguins' fans and the organization itself. They even put together a special video montage that was played at the game on Sunday March 19 which can be seen below. I hope you enjoyed my story. I would love to hear about your hockey hero's. Comment below or tweet me @MedinaMarie_PI on Twitter with your experiences meeting them if you have been given the chance (or if ever given the chance). Tags # Jaromir Jagr # Pittsburgh Penguins. Labels: Jaromir Jagr, Pittsburgh Penguins. I remember the day I became a hockey fan, 1980 Winter Olympics. Do you Believe in Miracles? I remember the exact day I became a Penguin fan too. 1984 and the Penguins drafted a very young and very talented Mario Lemieux. Jagr is my second favorite, sorry Jagr,the Magnificent one arrived before you. I would love to see Jagr retire as a Penguin it just seems right. I am so proud Mario bought this team they do so many good things for kids and the community. Makes me proud to be a Penguins fan.